3. Now we need to install the package “openSSL”, which is used to generate CSR certificate and RSA key. 4. Now we’ll generate the Private key with openSSL command. By above command, We have generated the private key with 2048 bit encryption with name “rs.key”. -key pr.key - we need key file to create CSR certificate and we have already generated this key in previous command. 6. 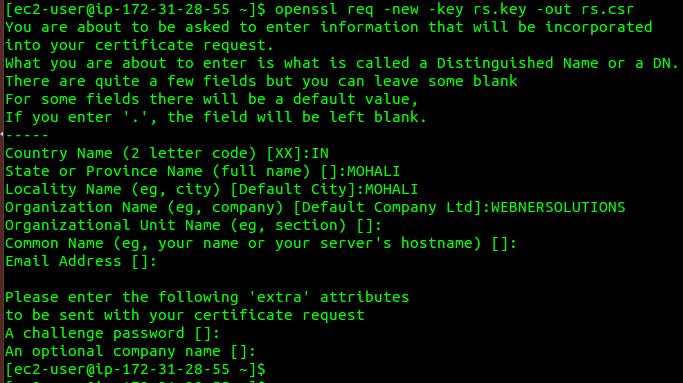 Now we’ll generate Self-Signed-Certificate of X509 type which is valid for 365 days. 7. After certificate files are created, we’ll copy them and place them at right location. 8. Now open the secure web server configuration file and edit the line number 106 and 113 as showing in following screen shot. Replace these lines with following lines. Now you can check the parameters are right or not by following command. 9. Configure Apache web server file. 10. Add the port number 443 in the Inbound security groups and then restart the HTTPD service.